Harby runner Gemma King had a marathon debut to remember after travelling to Paris to take part in one. The 33-year-old was part of an immense gathering of some 55,000 runners and participant were sent off on their journey from the Arc de Triomphe and would run a course through the French capital’s most famous avenues and plazas. Gemma completed the 26.2-mile course in a time of just over five hours. She said: “I felt amazing crossing the line. I literally couldn’t believe I had done it. Gemma ran the Paris Marathon for Lymphoedema Support Network, in memory of her grandma who died in December from Lymphoedema. She also decided to dedicate each mile to Lymphoedema sufferers on her way around the course, and so stitched 26 ribbons to her t-shirt to think of them. “It was so emotional knowing I was doing the run for a cause that meant so much to me,” said Gemma. 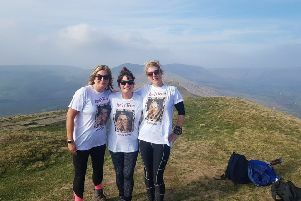 “My grand fundraising total is £2,646 for the Lymphoedema Support Network. “I would love to do another marathon, perhaps London if I am lucky enough to get in.